By Mark - Argentina - 10 Oct/02 - Viewed 1786 times. By now we have probably walked down every street in the centre of Buenos Aires. Yesterday we went to the Congress building and then the Plaza de Mayo. The Presidential Palace is here. For some reason it is bright pink - this is probably why no-one wants to be president. There is political graffitti everywhere. Afterwards, we walked north to the cemetary where all the important people get buried. It is quite a long way, but you get to walk through the nicer neighbourhoods. The cemetary itself is free to get into and very impressive - there are many narrow paths with huge ornate family tombs looming over them. Some of the more impressive are like miniature churches topped with statues of angels. All around the cemetary there are hundreds of cats just lying around. I�m not sure why they all hang around the cemetary. There were also lots of workmen, and likewise they were not doing very much either. One thing that was lacking though was tourists. 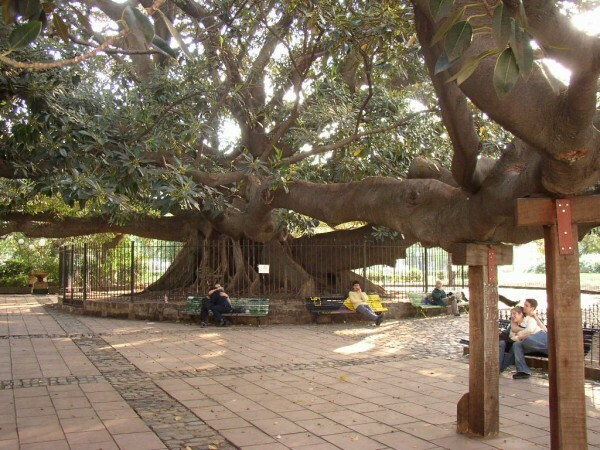 The Lonely Planet said "follow the crowds of tourists to find Eva Peron�s grave". Maybe they meant cats, or workmen. Either way, we couldn�t find her grave. Afterwards we went to the Museum of Fine Art, which is nearby and also free. Today, we took the subway to the Botantical Gardens and the Zoo in Palermo, north of the center. We were hoping for a day of less walking, but ended up spending the whole day walking around those attractions anyway. The subway was fast, and easy to use. The Botanical Gardens were really impressive - there were hundreds of strange trees and best of all it is free. Like the cemetary, there were also lots of cats here. I think they just hang around the tourist attractions. The zoo was okay as zoos go. A$7.90 entry is pretty cheap, and there were some baby tigers. Tomorrow we have to get up early and fly to Iguazu.